With only a few days before Halloween, you may be wondering what to binge this Halloween. The Curious Creations of Christine McConnell on Netflix is a wicked and mischievous delight. It’s difficult to describe Ms. McConnell but I will start with stark raving mad genius. As a baker, seamstress, and stylist she creates delectable desserts that are beautiful and defiantly dark. 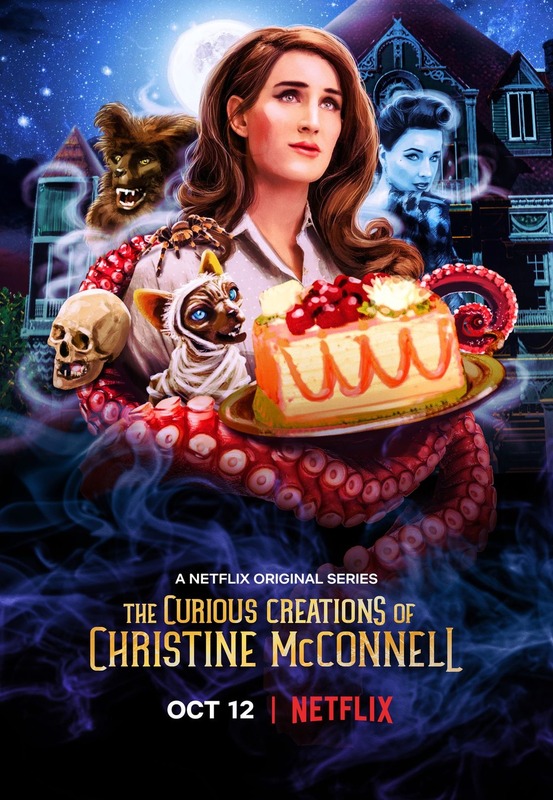 Her six-episode show on Netflix is equally whimsical, funny, dark, and yes, even informative. You may never attempt any of these projects but it is entertaining to see them brought to life. The show dabbles somewhat into the process along with some tips and tricks but never really fully reveals a whole project from beginning to end. I appreciated that this magician didn’t give away all her tricks and she fully understands the motto: always leave them wanting more. In this case, you can pick up a copy of her book, Deceptive Desserts and follow her on social media (Instagram). Christine: What have I told you about arson? Despite the obvious trappings, this is definitely not a kiddie show. Also surprising is an interesting through-line involving a gentleman caller, problematic neighbors, and of course, family drama. The last episode is set on Halloween, so make sure to make it all the way through the end. I have been a very big fan of Christine McConnell for years, she inspired my monster house display this year, and I cannot wait to see what she does next!